RIVERSIDE, CA February 17, 2010: Kevin Sacalas was one of only 43 drivers out of 100 to successfully complete the 2010 Griffin King of the Hammers race held in Johnson Valley on February 12th. King of the Hammers was Sacalas’ 2nd race to date driving his #4435 rock racing vehicle which fans have affectionately named “The Big Ugly.” Sacalas built The Big Ugly in his garage in the summer of 2009 and debuted the vehicle racing as Team Viking Offroad at Best in the Desert’s Vegas to Reno: The Long Way: a punishing 3-day one thousand mile race in which Sacalas took 1st place in the Ultra4 class. Sacalas is sponsored by BFGoodrich and was the only competitor to race on their new 42” Baja T/A sticky compound tire mounted on new Raceline 20” wheels designed specifically for this tire. According to Sacalas, “the sidewalls held up, I didn’t have a single puncture all day.” When asked what he felt contributed to his speed in the desert, Sacalas responded, “Bilstein helped me get the most out of my shocks in the whoops. When we found out we had a chance to run BFG’s 42” tires I immediately called Bilstein and they didn’t hesitate to help me dial the shocks in to accommodate a larger tire.” Additional sponsors that contributed to Sacalas’ successful 2nd race were: founding sponsors Viking Offroad, Spidertrax, JE Reel and Ballistic Fabrication. About Kevin Sacalas – He is a 26 year old native Californian who has been off roading at the Hammers for the past 4 years in his highly modified ’01 TJ. 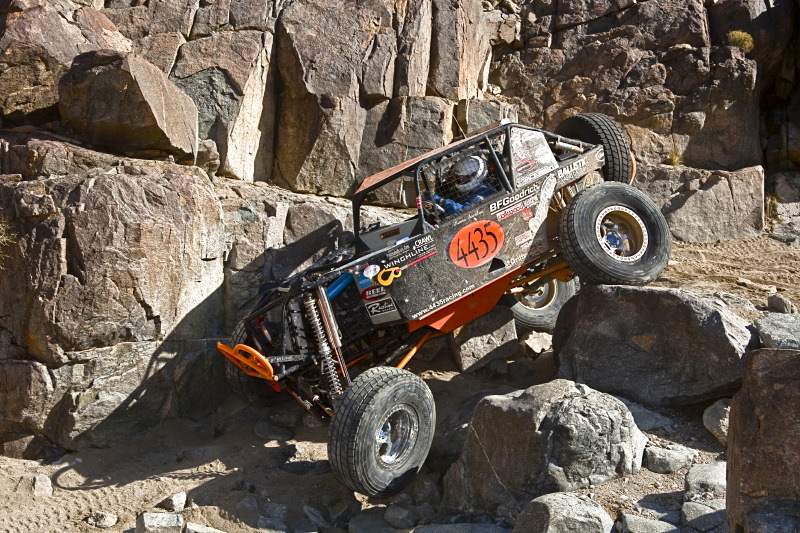 He attempted to qualify for the 2009 King of the Hammers by successfully completing the LCQ in his TJ. Due to limited spots, his qualifying time was just shy of the cutoff. Missing the LCQ prompted Sacalas to fabricate The Big Ugly. He intends to race the King of the Hammers “Grand Slam” this year which includes: King Of The Hammers, SilverState 300, Land’s End Hill Climb and Put up or Shut Up.